On Sunday, November 16th, Open Doors Mexico celebrated one of the most anticipated victories of the last two decades when the last brother represented by Open Doors on the Acteal case finally returned home after 17 years in prison. Lorenzo was released following the recognition of his innocence by the Supreme Court of Justice of México, last November 12th. 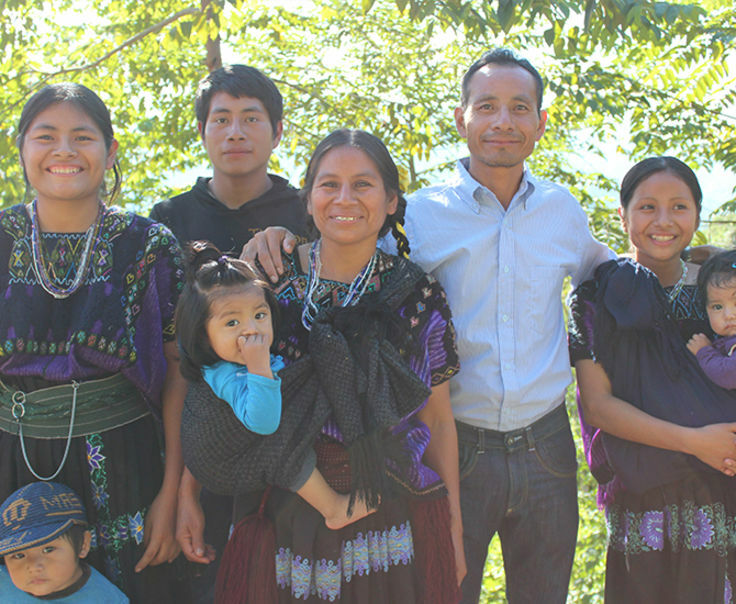 It was a beautiful, sunny day in the community of Bajobaltik, Chiapas when the Open Doors team drove Lorenzo back home to his small village. Anxiously waiting for him were his grandfather, father, wife, and children, many of whom could no longer recognize him. Lorenzo´s younger son, Abelino, 23, was the first to hug him, asking; “Are you Daddy?” Lorenzo then recognized the son, who had been only 6 years old at the time of his imprisonment, and embraced him warmly. Both wept like children as the rest of Lorenzo’s family eagerly waited for their turn to greet him. The beautiful moment was briefly overshadowed by the indigenous cultural practice mandating that guests should be offered food. Even while rejoicing at their father’s return after 17 years in jail, this custom was still top priority. Following breakfast, everyone joined together for a Thanksgiving Sunday service. It was a glorious moment where the Lord was praised for His victory on the cross, and the return of their brother Lorenzo. Afterwards, the family continued to honor the guests by preparing a turkey broth, a traditional meal among the Tzotzils to celebrate memorable events. Lorenzo’ mother, Mary, shared that since her son’s imprisonment she had suffered from migraines, lack of sleep, high blood pressure and anxiety. The Open Doors team prayed for healing. Loida, Lorenzo´s wife, and her family, tearfully thanked everyone who helped make their dream a reality. She specifically thanked the Open Doors staff for faithfully driving her and her family to visit Lorenzo, every two weeks over the last six months. She also gave thanks to the Lord for all the brothers and sisters around the world who have donated to this ministry, so that Open Doors can continue helping other Christians who suffer for their faith in Jesus. Although he is now free from prison, and the government will compensate him for his wrongful imprisonment with a new house and land on which to live, Lorenzo is not allowed to live with his family in their home community due to certain rules and agreements. Upon their release, all Acteal Case prisoners were forced by the government to sign an agreement binding them to certain rules and restriction; the imposition of this agreement was justified with the argument that it would protect them from possible attacks. Nevertheless, Lorenzo and his family believe that the same God that protected them throughout the 17 years of Lorenzo’s imprisonment is the same God that holds a better future for their lives. Before the Open Doors team departed, the family asked them to take photos. The laughter and fun was infectious. Even Mary, Lorenzo´s mother, said that the anxiety, sadness and pain were gone, and she too joined in the joyous laughter. The drawn out court battle to free the Acteal Case prisoners is finally over… but the battle to help these men transition back into a normal life is just beginning. Please pray for Lorenzo and the other men, specifically for restoration, healing and forgiveness. Also pray for the Open Doors team in Mexico; that they would have wisdom on how to best serve these brothers and their families. We are awed, Father, by the astonishing work You have done in Chiapas, Mexico. After so many years of praying for these men, all of the men who were unjustly accused have been set free. And now, as they transition back to normal life, we ask that You protect them from pressures and threats from the community. Fill them with forgiveness and a Christ-like attitude in all that they say and do. And while they cannot return to live with family members, we ask the You provide purpose, restoration and joy in their lives. In the name of Jesus, our hope and joy, Amen.